Cas9-targeted homologous recombination methods are now widely used for tagging C. elegans genes at their endogenous genetic loci. The primary advantage of this method is that it involves minimal modifications to the native regulatory elements controlling gene expression. This is preferable for experiments that require the spatio-temporal control of tagged protein expression to be comparable to native expression. However, it is often desirable to study a protein of interest in the context of a particular cell or tissue that represents a subset of its native expression profile in the worm. For genes that are expressed in a wide range of cell types, signal from tagged protein expression from neighboring cells may mask the signal from the particular cell or tissue under investigation. Recently, Schwartz et al. described a FLP/FRT recombination based method to append cell/tissue specific tags at the N- or C terminus of C. elegans genes (Schwartz et al., 2016). Here we describe an alternative method using the Cre-Lox recombination system to selectively append tags at the endogenous genetic locus only in cells or tissues of interest, while ensuring untagged protein expression in other cells. The C. elegans che-12 gene is expressed in a subset of ciliated sensory neurons in the head and tail of the animal, including the amphid neurons with simple rod like cilia (Bacaj et al., 2008). CHE-12 localizes to the cilia in these neurons which form a bundle in the amphid channel. Previously, we observed CHE-12::GFP puncta along the amphid cilia suggesting coupling to intraflagellar transport machinery, however, the arrangement of amphid cilia in a bundle inside the amphid channel presented a challenge to follow a single fluorescent particle continuously from the cilia base to the distal tip (Das et al., 2015). In order to better visualize CHE-12 dynamics in a single amphid cilium, we devised a strategy to fluorescently tag the endogenous che-12 gene in a single amphid neuron, the ASER neuron. 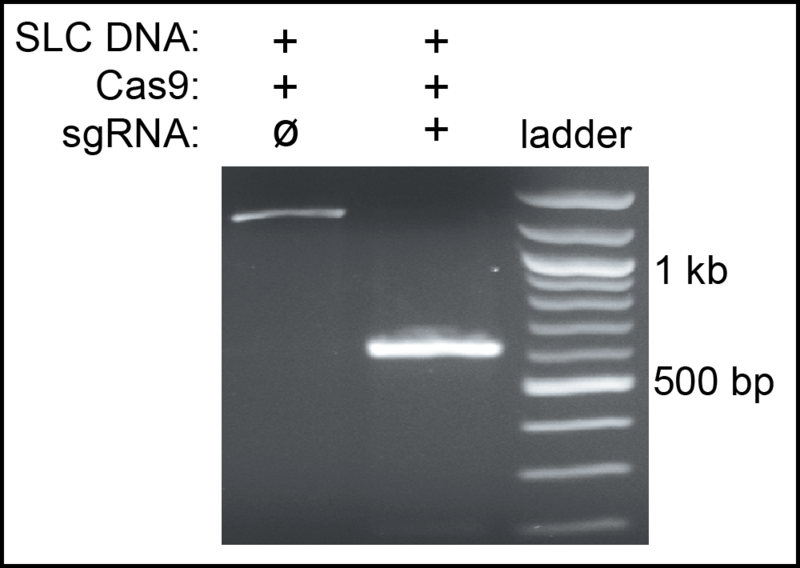 Our cell-specific tagging cassette (CTC) includes a Stop codon and a strong terminator sequence (let-858 3’UTR) bounded at either end by two LoxP sites within short synthetic introns, followed by the coding sequence of any fluorescent protein (Figure 1A). We inserted a hygromycin resistance gene in the inter-genic region between the che-12 and B0024.4 genes for the selection of positive knock-in candidates. The CTC is introduced between the end of the coding sequence of the gene of interest and its stop codon using Cas9-targeted homologous recombination methods described in Dickinson et al., 2013. Animals bearing a correct insertion of the CTC at the selected genetic locus express the untagged version of the protein. A cell/tissue specific promoter is then used to drive the expression of Cre-recombinase in the specific cell/tissue where expression of the fluorescently tagged endogenous protein is desired. Cre-recombinase will excise out the region flanked by the LoxP sites in these specific cells, creating a fusion of the gene of interest and the fluorescent protein coding sequence, leading to cell/tissue-specific tagging of endogenous proteins. See Figure 1A an illustration of this strategy. We introduced a CTC as outlined in Figure 1A at the 3’-end of the che-12 coding sequence using Cas9-targeted homologous recombination. 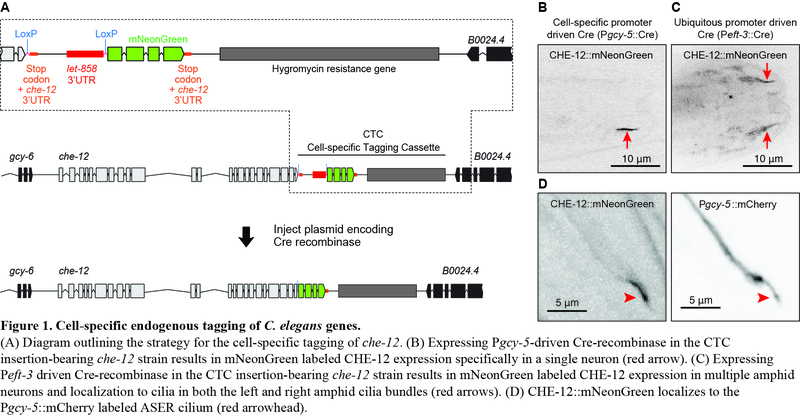 We then used a ubiquitous or cell/tissue-specific promoter-driven Cre-recombinase, expressed from an extra-chromosomal array to allow selective recombination in those specific cells and fuse the che-12 coding sequence with mNeonGreen coding sequence. This strategy was successful in selectively labeling CHE-12 in a single neuron when we used gcy-5 promoter-driven Cre-recombinase (Figure 1B). In contrast, when we used a ubiquitous promoter such as Peft-3 to drive Cre-recombinase expression, we observed CHE-12::mNeonGreen signal in all amphid neurons (Figure 1C). The tagged CHE-12::mNeonGreen fusion protein localized correctly to the ASER cilium (Figure 1B and 1D). This cell-specific tagging strategy is applicable for cell and tissue types for which strong cell/tissue-specific promoters have been characterized. This strategy can also be modified to delete domains within a protein or the entire coding sequence of a gene in a desired cell type by introducing synthetic introns containing embedded LoxP sites at the boundaries of a segment targeted for deletion. Bacaj T, Lu Y, and Shaham S. (2008). The conserved proteins CHE-12 and DYF-11 are required for sensory cilium function in Caenorhabditis elegans. Genetics. 178, 989-1002. Das A, Dickinson DJ, Wood CC, Goldstein B, and Slep KC. (2015). Crescerin uses a TOG domain array to regulate microtubules in the primary cilium. Mol Biol Cell. 26, 4248-4264. Dickinson DJ, Ward JD, Reiner DJ, and Goldstein B. (2013). Engineering the Caenorhabditis elegans genome using Cas9-triggered homologous recombination. Nat Methods. 10,1028-1034.